Moamer Kadhafi is in top health and planning his country’s defence, his spokesman said, as new regime fighters voiced concern over civilians trapped in the besieged town of Bani Walid. While anti-Kadhafi fighters were poised to strike at the loyalist oasis town at the slightest hint of provocation, Kadhafi’s spokesman Moussa Ibrahim insisted that the toppled leader was busy planning to re-take his country. Kadhafi is “in excellent health and planning and organising Libya’s defence,” Ibrahim told Syria’s Arrai television channel on Monday. “We are still powerful,” he said, adding that the sons of the fugitive dictator “had assumed their role in the defence of and sacrifice for” their country. He however did not name them. But despite the brave show of face, a Nigerien government source said prominent regime officials had fled across the border. They included Kadhafi’s internal security chief Mansour Daw, who was earlier reported to be in Bani Walid with at least two of the fallen strongman’s sons. Kamal Hodeisa, a Libyan defence ministry official, told AFP in Tripoli that anti-Kadhafi fighters would “move if there is an act of aggression by Kadhafi’s forces against our rebels inside Bani Walid or if they attack civilians. “There is debate among rebels whether to go forward or to stay but I think in the end they will respect the deadline,” he said, referring to a truce until September 10 to try to negotiate the surrender of the last Kadhafi strongholds. Abdullah Kenshil, the chief negotiator for Libya’s new government, said civilians were being held hostage in the centre of the town, in administrative buildings and in five or six nearby villages. Negotiations for the surrender of Bani Walid, southeast of Tripoli, broke down late Sunday but there was little movement on that front on Monday despite concerns that local families could be held as human shields. Local officials said most senior figures had fled with Kadhafi’s most prominent son, Seif al-Islam, who according to Naduri left a few days before for Sabha, further south, that is still in the hands of regime loyalists. Two other sons of Kadhafi, Saadi and Mutassim, were also reported to be in Bani Walid and it is suspected that the strongman himself crossed through the oasis town although it is unclear when. But Daw and some 10 others were on Monday in the northern Niger town of Agadez, having been brought across the border by a top Tuareg leader allied to Kadhafi, Tuareg sources said. 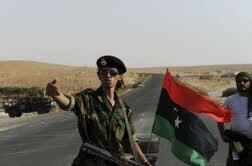 No clashes were reported on Monday in Kadhafi’s hometown of Sirte or the southern oases of Sabha and Al-Jufra. China meanwhile denied reports of offering Kadhafi arms at the fag end of his regime. In Beijing, the foreign ministry acknowledged Libyan officials had visited in July for talks with “interested companies” but insisted no arms contracts had been signed nor any direct or indirect exports made. Citing secret documents it had obtained, The Globe and Mail reported that state-controlled Chinese arms companies were ready to sell weapons and ammunition worth at least $200 million to Kadhafi in late July. A British inquiry into alleged complicity in the mistreatment of suspected terrorists said Monday it would look into claims that foreign spy agency MI6 was involved in rendition to Libya. Britain on Monday re-established its diplomatic mission in Tripoli. The UN Security Council is on Friday to discuss the launch of a wide-ranging mission to Libya to help tackle police reform, justice and election preparations, a UN diplomat told AFP on Monday.